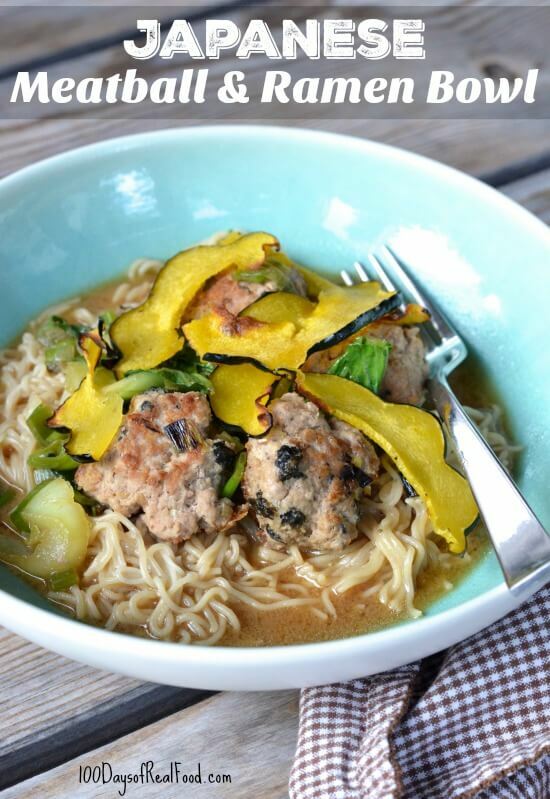 I’m excited to share a yummy new recipe with you today – Japanese Meatball & Ramen Noodle Bowls! It’s a dish I first had a few months ago, thanks to one of my Blue Apron boxes, and it was a BIG hit with my whole family. The only problem was that the box of ingredients included a spice blend I was not quite sure how to recreate, until now. Blue Apron gave me the recipe, so I am able to share it with you in today’s sponsored post! Before we dive in though, I want to say that trying new recipes like this one is part of what I have enjoyed about occasionally using Blue Apron. It sort of forces you to branch out, which in my mind is a VERY good thing! Getting a box of ingredients and recipe cards also gets you into the kitchen, which can do wonders for your health. And that’s because cooking [from scratch] is “the single most important thing we could do as a family to improve our health and general well-being,” according to Michael Pollan. 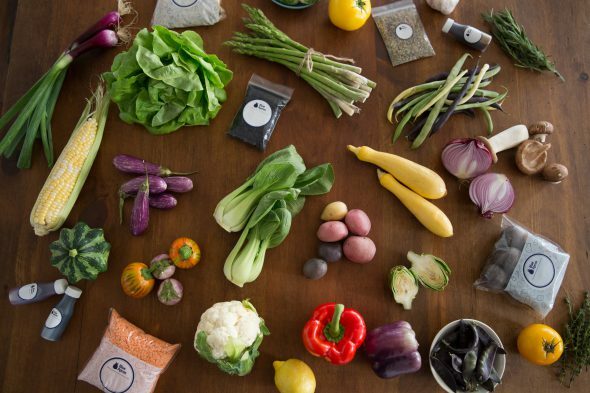 Farm-fresh ingredients (and corresponding recipes) measured out into the right proportions, packaged together in refrigerated boxes, and delivered to your doorstep each week. Meals that can be prepared in under 40 minutes. New recipes and cuisines you may have not tried before to help you get out of your dinner rut! Either a 2-person or family plan with 4 servings. The choice to skip or cancel the weekly service at any time – no commitment! 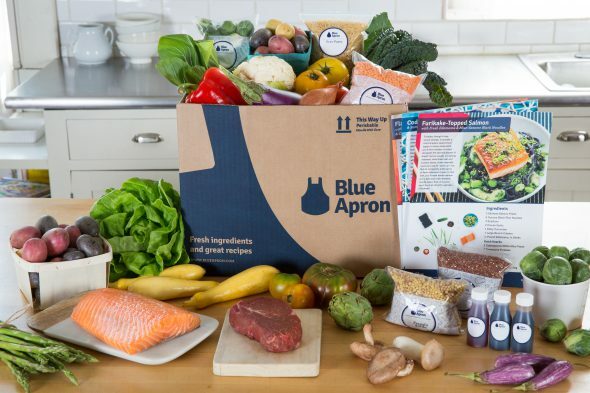 Special Offer: Try Blue Apron for Free! The first 50 of you to sign up will get your first three Blue Apron meals for free! Click here to claim this offer. Preheat the oven to 450° F. Cut and discard the ends of the squash. Cut it in half lengthwise then cut 1/4-inch thick slices crosswise. Toss squash pieces with olive oil on a baking sheet, arrange in a single layer, and roast until tender when pierced with a fork, about 15 - 20 minutes. Boil the ramen noodles according to package directions and set aside. For the sauce, whisk together the water, miso paste, soy sauce, and honey and set aside. Discard the root ends of the bok choy and roughly chop the remaining leaves and stems. In a large bowl, use your hands to combine the pork, crumbled nori, breadcrumbs, half the white bottoms of the green onions, half the ginger, sesame seeds, salt, and pepper. Form into about 24 equal-sized meatballs. In a large pan with high sides (or a pot), heat 1 tablespoon olive oil on medium-high heat. Add the meatballs and brown on all sides until cooked all the way through, about 6 - 8 minutes. Stir in the remaining ginger and white parts of the green onions for about 1 minute. Whisk in the sauce ingredients along with 2 cups of water and the bok choy. Simmer on medium-low, stirring occasionally, until thoroughly combined and the bok choy has wilted, 4 - 6 minutes. Divide the ramen noodles among 4 or 5 bowls. Top with meatballs, sauce, and veggies (including the squash). Garnish with remaining green parts of the green onions and serve warm. What is the prep time on this recipe? 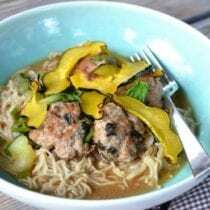 It appears to be 30 min if you bake squash, boil noodles, and cook meatballs at the same time. big help is to assemble everything needed first. I have red miso paste in the fridge. Is it OK to substitute red for white miso? where have you found whole wheat Ramen? I found it at our health food store – Earth Fare. Where does one find whole grain ramen noodles and what is the brand? Are they actually 100% whole grain? The meatballs sound yummy! We use this brand http://www.lotusfoods.com/index.php/products/rice-ramen/. I use Roland organic Buckwheat soba noodles cheap and they don’t bother me. I used Blue Apron for a few weeks and literally every recipe was delicious. However, the prep and cook times were pretty long so I had to quit using the service. I am still looking for something healthy, quick and delicious. Blue aprons is weekend fare, I need quick weekday fare with the limited Amount of time between the end of my workday and my kid’s bedtime. This has been my problem as well. The recipe will say 30 min prep – 15 min cook time, but by the time I have washed/chopped/shredded the veggies the 30 minutes are gone. Maybe I am a slow chopper but I double the amount of time the recipe says and that usually comes out pretty close to actual prep/cook time. My mom and I did a recipe together the other day and even with two of us it still took longer to prep than what was stated. I can only imagine that doing it with kids like in the commercial would add even more time. I’ve done both Blue Apron and Green Chef. Green Chef seems much quicker to me and has organic ingredients. I’m having trouble finding white miso paste in my regular grocery store. Any tips on where I can buy it or something I can substitute in place of this ingredient? Hello. Do you have an Asian market close to you? I really want to try this recipe, but I don’t know what else I could use the white miso paste for. Any recommendations from others?